"This was an operation that was a rogue operation. This was an operation where individuals ended up exceeding the authorities and responsibilities they had," Jubeir said on the U.S. broadcaster Fox. Jubeir had extended condolences to Khashoggi's family earlier on Sunday. "Unfortunately, a huge and grave mistake was made and I assure them that those responsible will be held accountable for this," he told Fox. The White House said late on Sunday that U.S. President Donald Trump had spoken to French President Emmanuel Macron and the two had discussed a range of issues including circumstances surrounding Khashoggi's death. Turkey's Anadolu agency said early on Monday that Erdogan and Trump had spoken on the telephone and agreed that "all aspects" of the case needed to be cleared up. "I am not satisfied until we find the answer. But it was a big first step, it was a good first step. But I want to get to the answer," Trump told reporters this weekend, when asked about the Saudi investigation and Riyadh's firing of officials. In an interview with the Washington Post, Trump said that "obviously there's been deception, and there's been lies." 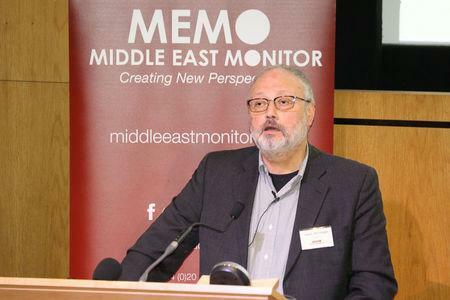 He had suggested last week that "rogue killers" might have been responsible for Khashoggi's death, a comment critics called an effort to play down the crisis. A leading Republican U.S. senator said he believed the crown prince was behind the killing, adding that the Saudis had lost credibility in their explanations of his death. "Yes, I think he did it," Bob Corker, chairman of the Senate Foreign Relations Committee, told CNN, referring to the crown prince.